Can Catalonia consolidate support for "the republic" on the December 21 election? 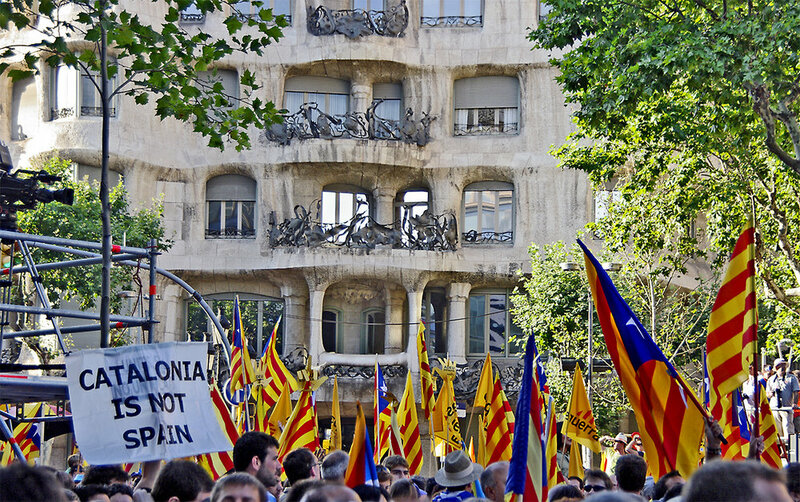 When I travelled to Barcelona for the Catalan consultation of 2014 the mood was relaxed, sanguine almost. The intense Gaudí monoliths that surround you in the city, they tower over you with their great gargoyles; art nouveau on steroids. A sobering reminder toward - not just the enduring fortitude of Catalan culture - but, perhaps, the benighted spirit in which Gaudí viewed Spanish imperialism. At night time they're truly beautifully frightening works of architecture. I last wrote about Catalonia in June 2017. Just as the region was warming up for a Referendum on Catalan Independence, but is it a region anymore - or is it a country? The anti-capitalist, far left CUP is "the only pro-independence party running in the December 21 election pledging that its representatives will push for a Catalan Republic", according to their candidate, Bel Olid. CUP were instrumental in the ascension of Carles Puigdemont to President of the region in 2016. So much of what has happened seems unthinkable, even then. The idea that article 155 - a Spanish constitutional tool used to impose direct rule on Catalonia - would be invoked, the brutal violence of The Guardia Civil against the Catalan civil population who only wanted to vote during the global phenomena that was their "1-O" independence referendum in October of this year. A common opinion amongst Spanish acquaintances that I've met here in Stockholm where I live: "We don't like Nationalism and what it stands for, but we think the Catalans should be allowed to vote." It's clear Spain's edicts didn't work and the spirit of pacifism won the day, but at a cost with the incarceration of much of the Catalan cabinet and activists too. The idea was that "the law of transitional jurisprudence" would be presented to provide a framework for The Republic of Catalonia. That hasn't happened. So what has, and at what stage is Spain's most prosperous region as they build up to elections that could - they hope - reinforce their claim for full autonomy? "Despite all the efforts from the Spanish state to block the democratic Catalan cause for independence, we will not give in to their repressive threats and following the elections on December 21, we just want Catalan politicians to develop the approved Catalan laws and consolidate the Catalan Republic." Anna's work first came to my attention in November at an event in Edinburgh organised by the Scottish think-tank, Common Weal. She is spokesperson for the ICEC: a Europe wide network that seeks to connect democrats in favour of self-determination across the continent, including constituted states such as Sweden. "The Spanish manipulation of the Catalans cannot blur the right understanding of freedom, justice, equality and peace, these are deep down Catalan values that will keep driving the Catalan cause. Another victory will reaffirm the 1st of October popular, official mandate to make Catalan independence a reality." "Up and until now, ERC seems to be leading the polls by a narrow margin, we must point out that people in jail or prosecuted can still run for public positions, they have not lost that right. If they are still in jail for the opening session, they might not be able to attend if the judge does not grant permission." Barcelona City Council Republican Left leader, ERC. The importance of this election cannot be underestimated. In a way, this one is even more important than the referendum as it will be recognised and was actually called by the Spanish prime minister, Mariano Rajoy. A large pro-independence majority, hypothetically, could pave the way for a Referendum to amend the constitution which deems any referendum on Catalan independence illegal. Outdated constitutional stipulations can be changed: Ireland will vote in 2018 on changing its abortion laws, for example. "A large majority in seats and votes would prove that independence is the main option of the Catalan people. If the margin is narrower the present situation will be harder to change." Many are/were led to believe that 1-O referendum was economically driven. The reality is that it was about self-preservation. Self-preservation of a culture, a language. The beating heart of a community.